SyncTunes did something for me that a lot of other freeware for MacOSX could not. It can sync your iTunes to all sorts of devices, but for me, it was mainly my PSP. Why did I need my iTunes on my PSP? Beats. Yes, that lovely game needed more songs to play. SyncTunes itself is actually in a pretty GUI and pretty easy to use. There are a couple things that I would have done differently. For instance, as far as I can tell you can’t designate where the music is synchronized. There are predetermined places, but you can’t customize a preference that I can tell. Also, there are AAC volumes currently that do not play for Beats, but do play on the PSP as music. The conversion from AAC to mp3 doesn’t quite work for newer volumes unfortunately. It’s also not very clear with keeping tracks on your device (Use Merge to keep, and Replace to change out all the music in that directory). 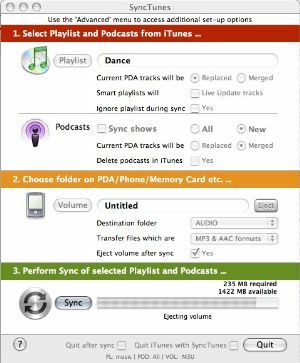 All in all, this version of SyncTunes is totally worthwhile mainly because it’s one of the few freeware for synchronizing music and still has a decently easy GUI to work with. Definitely worth looking at if you’re in need of some music love from your Mac.